When the media is playing, click on the player window and then click on the "embed" tab. Click on the Copy Code button on the right. The code will automatically be copied to your clipboard. You do not need to select the text first. 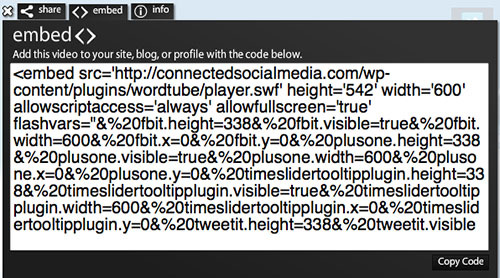 Paste the code in your blog or web page. That's it! Please encourage others to share and stay connected.